← Why a Junk rig? 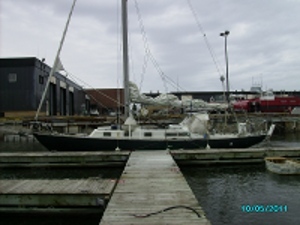 After a pleasant sail up the southern coast of Nova Scotia, through the Canso Strait and into Northumberland Strait I arrived in Charlottetown PEI on 9 May. The sail went well except for the last leg. I enjoyed SE winds 15 to 20 knots to Chedubucto Bay where the winds back to the south. After spending a night on Eddy point wharf I carried on my way up the strait passing through the causeway swinging bridge and associated locks. The winds backed to SW and later in the early hours to E. It then went calm for a spell and as i was rounding the south shore of PEI coming up to Point Prime a god awful northerly kicked in and it was a hard slog up Hillsboro Bay in Charlottetown harbour. A mixture of reefed down sails, tacking, and motor sailing did the trick. Wish it was a junk rig :-). Charlottetown yacht Club haven’t finished putting in all their docks yet but I’ve managed to find a temporary berth. Now it’s a matter of sourcing masts and getting them built of shipped here. Will report back when I have some progress in that regard. This entry was posted in alberg 37, junk rig and tagged alberg 37, charlottetown, junk rig. Bookmark the permalink. Great site with a lot of good info. One of the weaknesses of the junk rig is its windward ability, can you guess how would your boat behave in the windward slog you described after the conversion to JR? It seems to be a common notion among people who have never sailed a Junk rig that they perform poorly to wind. My experience tells me that the windward ability of a Junk is comparable to a Bermudan sloop, possibly better than (or at least as good as) a Ketch. The windward ability of any sail boat seems to be more determined by what’s below the water than above. In that respect the Alberg 37 makes a good cruising ship but will never win the America Cup.